The size of this kind of product can be changed according to the user. In this product, there are also 3 meters long and 8mm wide steel-resistance band and 8 sets of screw for one set. Our company also accepts those who only order screws or band part. The material is general Stainless Steel. The size of this kind of product can be changed according to the user. In this product, there are also 3 meters long and 12.7mm wide steel-resistance band and 8 sets of screw for one set. Our company also accepts those who only order screws or band part. The material is general Stainless Steel. The feature of this is put the different size of Hose Clamps in one blister card. The whole set of product will attach on the card via automatic forming vacuum machine. The size of these cards fixed and the figures on the cards from our company are also fixed. If you have a specially designed picture, our company can accept your supply of cards, but the size of card would have to be the same as ours. The size hedge about 1/2” to 3”. Packing both single size and assorted sizes in header pouch. The size of these header pouch fixed and the figures on the cards from our company are also fixed. If you have a specially designed picture, our company can accept your supply of card, but the size would have to be the same as ours. The size hedge about 1/2” to 3”. The feature of this is put two Hose Clamps with the same size in one blister card. The whole set of product will attach on the card via automatic forming vacuum machine. The size of these cards fixed and the figures on the cards from our company are also fixed. If you have especially designed picture, our company can accept your supply of cards, but the size of card would have to be the same as ours. The size hedge about 1/2” to 3”. Would you like your product to look more elegant? 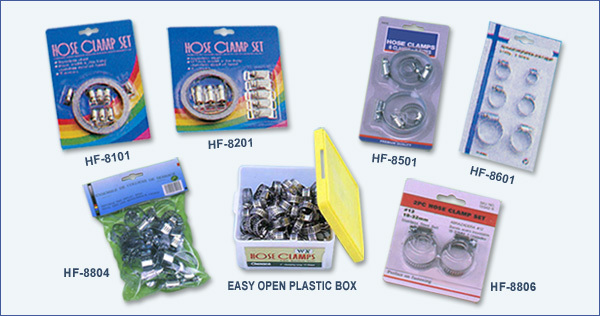 Then you can use our specially designed plastic box for packing. It can make these Hose Clamps look more exclusive and generous. You can choice lO pcs to lOO pcs for 1 box. The size hedge about 1/2” to 4”.